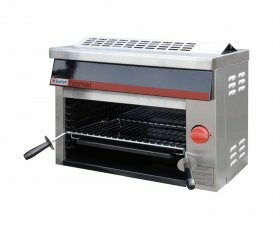 Bartlett Yeoman 600mm Electric Salamander Grill F-20E6. Suitable for wall, bench or on a stand. This unit grills 8 ounce (227 gram) steaks in 4 minutes and toasts 7 slices of bread in 1.1/2 minutes. 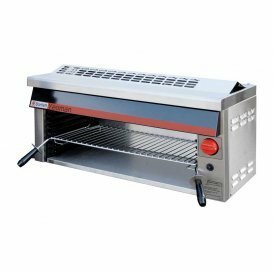 Features include a double skinned high quality stainless steel exterior, with vitreous enamel interior for excellent heat retention, safe operating temperature, durability and easy cleaning. Generously sized and insulated branding plate can be be used level or sloping. Insulated chrome plated toasting grid, with vitreous enamel crumb tray is designed to fit over, or replace the branding plate. Heated by a 3kW element, giving a rapid response and even heat distribution. Single knob and energy regulated for variable heat control. Seven runner positions fitted with end stops preventing accidental branding plate/toasting grill removal. Dimensions mm. H475 x W600 x D370. FX-207 Stainless steel bench stand. FX-218 cast aluminium brander plate & collection trough.